When you're near the bottom, there isn't much further to fall! July Class III milk prices remained unchanged from June at $9.97/cwt. Cheese and butter National Agricultural Statistical Service (NASS) prices declined only one penny, and dry whey prices increased slightly to offset the slight cheese and butter declines. 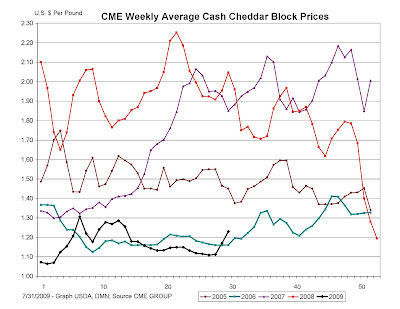 Chicago Mercantile Exchange (CME) cheese prices have increased a little in the last two weeks, but the NASS price runs about two weeks behind the CME prices (see April 2 post), so there was no relief in July. The USDA announced today a program to increase support levels for cheese and nonfat dry milk to temporarily assist the dairy producers. Cheese support prices for cheddar blocks will be increased from $1.13 per pound to $1.31 and barrel prices will increase from $1.10 to $1.28. If nothing else changed, this would increase protein prices by $.58/lb and Class III milk prices by $1.73/cwt. Other programs were announced in March, 2009 but they have had little immediate impact. The increase in support payments is scheduled to last through October, 2009.